OCD & A Little CPP! I have always known these things about myself but it seems that in the last few months, all of the “to-dos” have started to pile up. There is work…and then there is preparing for baby…and then housework & landscaping….oh, and did I mention, my hobbies. While prioritizing gets me started, I have a hard time “letting go”. Who knew I would stuggle so much with not being able to get it all done? Work obviously comes first…but with maternity leave just around the corner…I’m even more panicked! What is going to happen while I am gone!? Being home with my baby will be wonderful….but how will I let go of work?! Speaking of baby….the room HAS to get finished. It HAS to be perfectly decorated and her clothes have to be clean and ready for her. Oh, and I’m sure there is also a ton more reading I should be doing? “Good” moms probably have it all read by the time they are to 30 weeks. Not me. I will figure it out, right?! Oh My. You see my issue(s)!?! I think there is a name for all of this. It is probably a little something called, “Obsessive Compulsive Disorder.” Yes. That’s it. ANYONE WITH ME?! Now that you are all fully aware of my inability to “let go”….and my incessant need for everything to be done “just so”…I think we have made some progress. I feel better already. LOL. So, let’s get onto one of the few new recipes I have had the chance to create in the last two weeks, Chicken Pesto Pizza! On my flight home from San Francisco, exhausted and uncomfortable in my seat, I contemplated just what exactly Ryan and I could make for dinner. It needed to be something full of flavors we love….but never tried before. It had to be something that I could spell out for Ryan….but he could prepare on his own. Most importantly, it needed to be GOOD. I’d been craving a flavorful, satisfying meal at home! With all of that in mind….I created a recipe for this pizza. Start by prepping the ingredients. Pour 1 tbsp of Pesto and 2 tbsps of EVOO into a sandwich bag and mix well. Add chicken breast and let marinade for 10-15 minutes. Warm the grill to ~400 degrees. 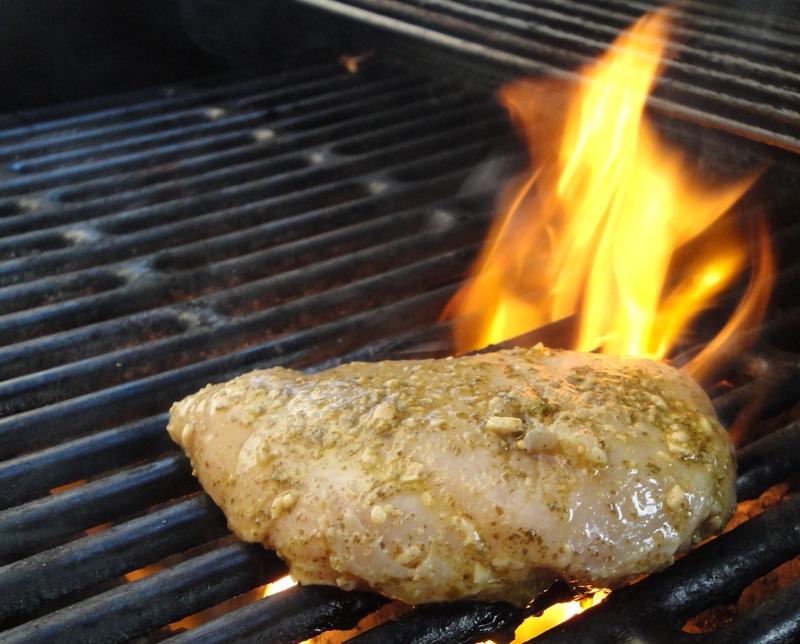 Grill the chicken for 6-7 minutes per side, or until cooked through. Be cautious not to overcook as the chicken will continue to cook once it is on the pizza. Slice chicken, wrap and set aside until ready to top the pizza. Turn one half of the grill OFF to cook crust and pizza via indirect heat. 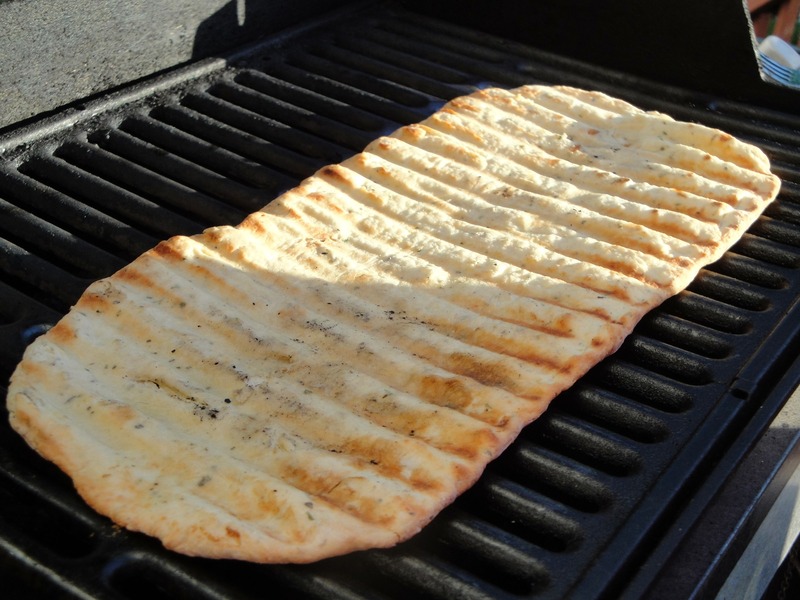 Place crust on the grill (burner side OFF) and cook until crust has formed and “grill marks” have been established. Flip and cook for an additional 2-3 minutes. 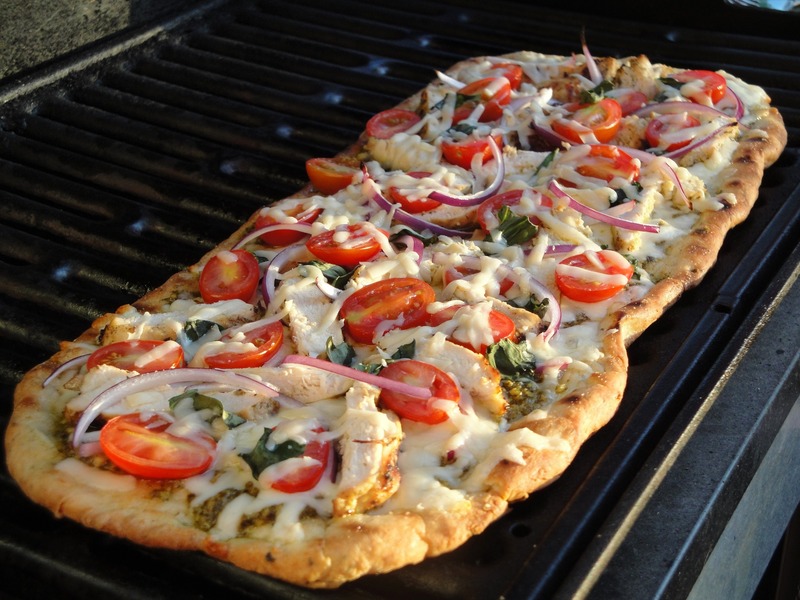 Once crust is lightly golden brown, remove pizza from grill and carry in on pizza stone. While the crust is warm, brush 1 tbsp of olive oil over the crust. Follow with the pesto sauce. 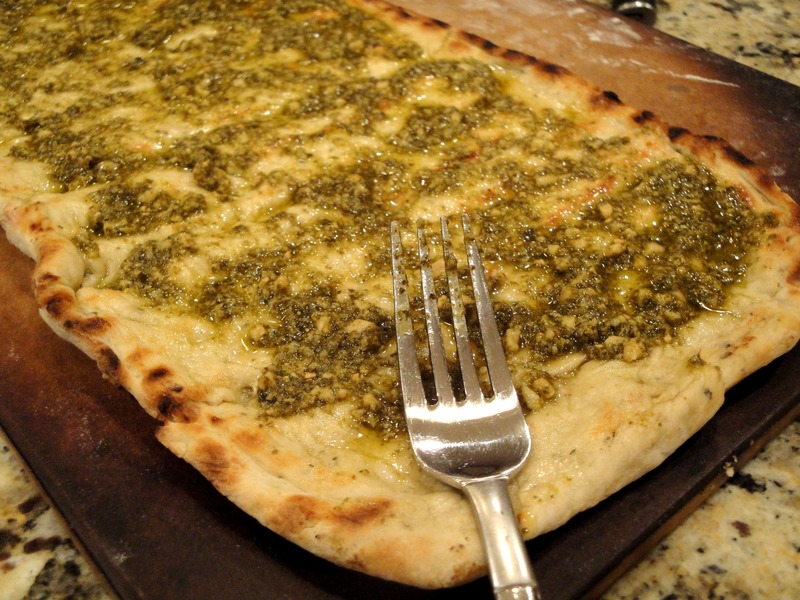 Pour 1/3 of the Classico Pesto sauce (jar) onto the crust and brush evenly across the crust. Next, dress your pizza! 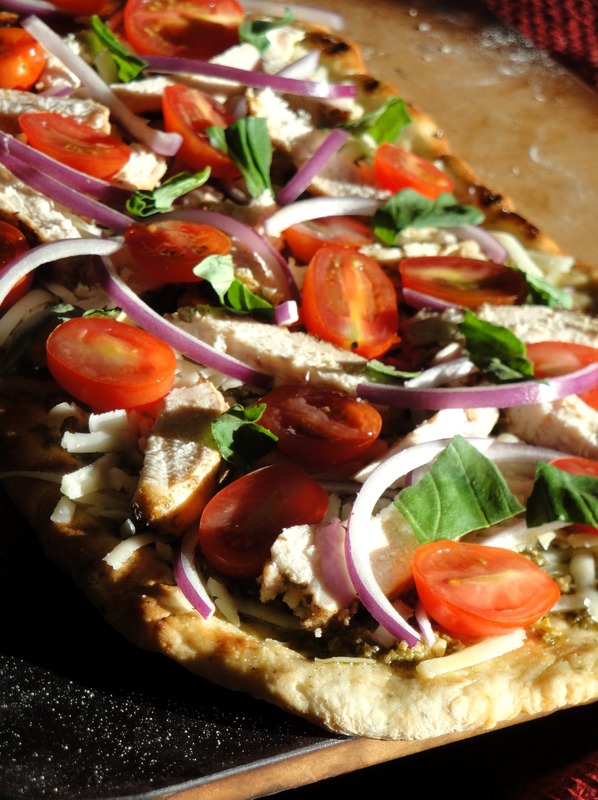 Layer sliced chicken, red onion, grape tomatoes and basil. Top with 1 cup of freshly grated mozzarella and 1/2 cup of freshly grated parmesan. Place pizza back on the grill (indirect heat once again) and heat at 400 degrees until the cheese is melted. Remove from grill and serve immediately. Does this pizza not look amazing?!? (If I must say so myself.) Maybe it was a long weekend away, traveling for work…..or maybe this pizza was just that good. 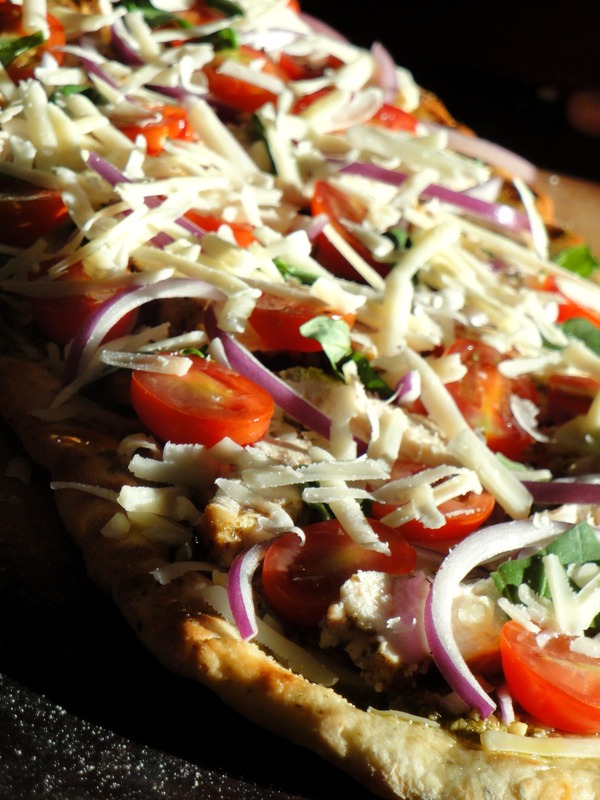 If these flavors are up your alley….give this pizza a try! We LOVE it. Good Afternoon from….Delta Airlines Flight 2508! I apologize for my absence from Indulge. Last week Ryan and I “indulged” in our last beach getaway before the arrival of Baby B. With a full week in the Dominican Republic…cell phones off, laptops closed, and nothing but sun, relaxation and buffet meals to fill our days, we soaked up every minute of it! I will write you soon with the details of the trip, photos of our favorite meals, and a few pics of my growing belly. In the meantime, let’s get back to FOOD! With a return flight home to Iowa getting in late on Monday night, I have spent the last few days catching up on as much work as possible….after all, I had just 3 days on Iowa soil before jet-setting again at the crack of dawn this morning. In the brief time I was home, Ryan and I filled up on some of our favorite simple meals (isn’t is funny how you miss your own cooking when you are on vacation?!) like our Strawberry Chardonnay Spring Mix Salad topped with a Balsamic Grilled Chicken Breast! I swear…this salad never gets old at our house. In those few days at home, we also made time to see the doctor and check on our little munchkin. To celebrate a clean bill of health and a complication-free pregnancy thus far, we grabbed a bite to eat at one of my VERY favorite lunch spots in Iowa City, HER SOUP KITCHEN. For those of you who live in or near Iowa City, be sure to visit this eclectic little restaurant in downtown Iowa City. It is locally owned and serves generous portions of DELICIOUS soups, salads, and sandwiches! Barb, who is always behind the counter and ready with a smile, knows as soon as I walk in that I am in need of her Roasted Portabella Sandwich and a cold glass of Cucumber Water! Honestly…this goes beyond cravings. That is one dang good sandwich! 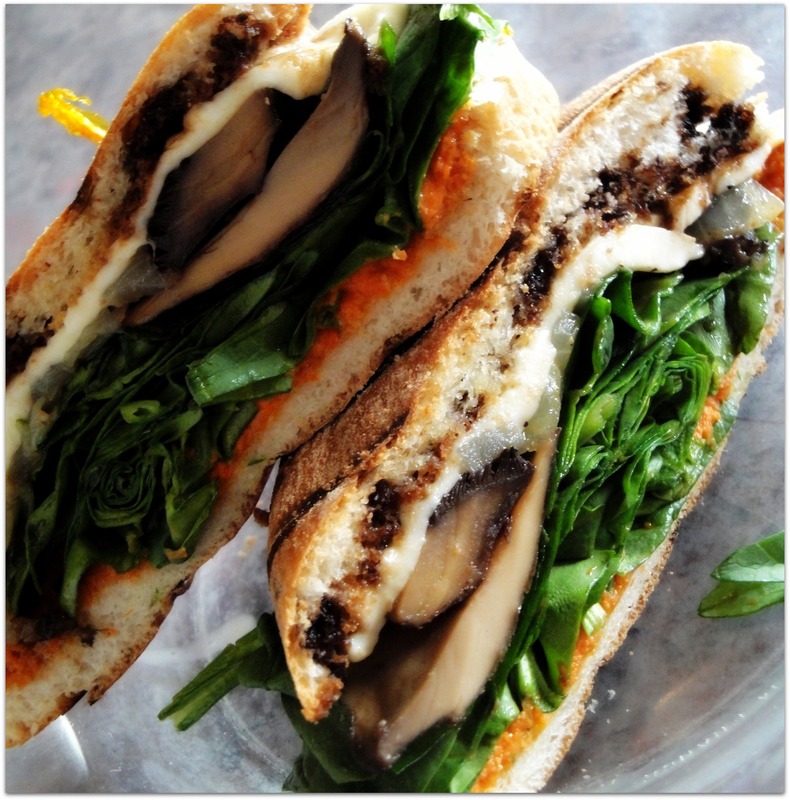 Portabella mushrooms, fresh mozzarella, roasted red pepper pesto, caramelized onions, fresh spinach, balsamic reductions and olive oil, served on toasted Ciabatta. 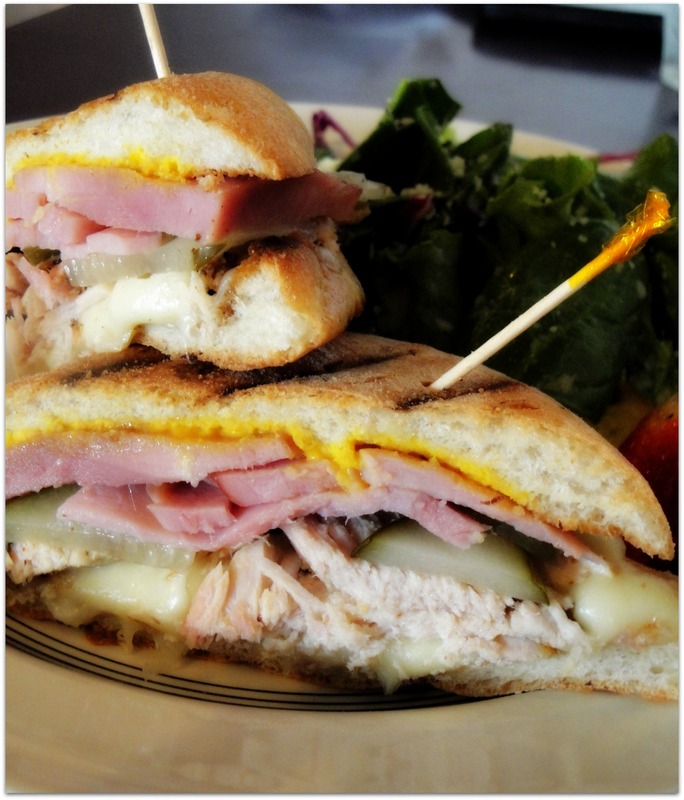 Ryan, on the other hand, is a huge fan of the Cuban sandwich! He finds the horseradish mustard a little strong (I think it burnt a nose-hair or two the first time he tried it) but has found that a mix of plain mustard to tone it down makes it “just right“! Dry-rubbed,slow roasted pork loin, shaved ham, Spicy Dijon,smoked swiss cheese and dill slices served on a Ciabatta bun. Since finding this special little restaurant just a few months back, I filled up my frequent diner card (ok…maybe more than once), introduced my husband, friends, and several co-workers. I have yet to find someone who is unhappy with their experience. While they aren’t open on Saturdays (hey, they need a day off too), be sure to stop in for lunch or give their Sunday brunch a try. I promise you won’t be disappointed! Mark.My.Words.